Baylor University Press, 9781481304733, 305pp. "Silly," "stupid," "irrational," "simple." "Wicked," "hateful," "obstinate," "anti-social." "Extravagant," "perverse." The Roman world rendered harsh judgments upon early Christianity--including branding Christianity "new." Novelty was no Roman religious virtue. Nevertheless, as Larry W. Hurtado shows in Destroyer of the gods, Christianity thrived despite its new and distinctive features and opposition to them. 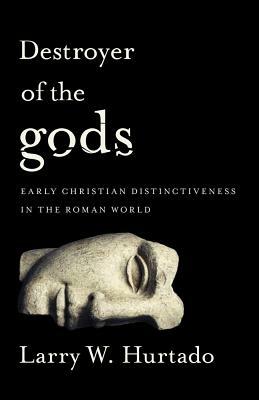 Unlike nearly all other religious groups, Christianity utterly rejected the traditional gods of the Roman world. Christianity also offered a new and different kind of religious identity, one not based on ethnicity. Christianity was distinctively a "bookish" religion, with the production, copying, distribution, and reading of texts as central to its faith, even preferring a distinctive book-form, the codex. Christianity insisted that its adherents behave differently: unlike the simple ritual observances characteristic of the pagan religious environment, embracing Christian faith meant a behavioral transformation, with particular and novel ethical demands for men. Unquestionably, to the Roman world, Christianity was both new and different, and, to a good many, it threatened social and religious conventions of the day. In the rejection of the gods and in the centrality of texts, early Christianity obviously reflected commitments inherited from its Jewish origins. But these particular features were no longer identified with Jewish ethnicity and early Christianity quickly became aggressively trans-ethnic--a novel kind of religious movement. Its ethical teaching, too, bore some resemblance to the philosophers of the day, yet in contrast with these great teachers and their small circles of dedicated students, early Christianity laid its hard demands upon all adherents from the moment of conversion, producing a novel social project. Christianity's novelty was no badge of honor. Called atheists and suspected of political subversion, Christians earned Roman disdain and suspicion in equal amounts. Yet, as Destroyer of the gods demonstrates, in an irony of history the very features of early Christianity that rendered it distinctive and objectionable in Roman eyes have now become so commonplace in Western culture as to go unnoticed. Christianity helped destroy one world and create another. Larry W. Hurtado is Emeritus Professor of New Testament Language, Literature & Theology in the School of Divinity at the University of Edinburgh and a Fellow of the Royal Society of Edinburgh. Born in Kansas City (Missouri), he now lives in Edinburgh.